We offer some thoughts here on the Democratic National Convention, Bernie’s complete capitulation and the nomination of Hillary Clinton for President. It has been an unusual election season so far, perhaps leaving us with more possibilities than before. You may submit your own take in the Comments Section at the bottom. Now that Hillary Clinton is the Democratic Party’s nominee, and Bernie Sanders is explicitly working for her election and for a leadership position for himself in the Senate, it’s a good time for us all to look back at the past year’s contest. From the first, I saw Bernie as a “New Left” representative, with all of the contradictions that brings with it. Bernie claimed “independence” in his long political career but as soon as he began his campaign for the Presidency he made clear, repeatedly, that he would support the eventual nominee of the party. The “New Left”, which I am not quite old enough to have been a part of, always had what looked to me like a conflicted and sometimes tortured relationship with the Democrats. For myself, maybe watching from a distance early on helped cure me of such an ailment. My political efforts invariably brought me into direct opposition to both major parties, more or less equally. It’s possible that Bernie’s campaign will produce a similar disdain in a large number of the millions who joined his campaign, and then watched heartbroken and helpless as he punched his own ticket to the upper echelons of Democratic Party leadership. Bernie campaigned on a platform of finishing the social democratic project of the New Deal, whose promise has yet to reach the tens of millions of the poorest people in our country, mainly because of racism and sexism. There is a third reason for this failure, and it is the absence of an independent left, which is present in all other advanced industrialized nations. This is a project that might have been completed by the “New Left” over these past 50 years but after several failed attempts (some of which I participated in!) this most recent effort appears to have ended yet again at the Democratic Party’s doorstep. Here, it must be understood that it is precisely the Democratic Party that has the most to lose in the rise and development of an independent left political force, and it is precisely the Democrats who are always at the forefront of efforts to block that development. Virtually all of the countries with programs like national health insurance, free or subsidized tuition at universities, and minimum wages that are both livable and are indexed for inflation, have leftist parties that constantly push the mainstream parties and they have political systems that support the development and growth of smaller parties. The two major parties here don’t cooperate on much apart from the exclusion of all outside competition, and here they in complete agreement! I’m afraid this is something Bernie knows all too well, and I’ve seen a video from his time as a member of the House of Representatives when he talked about how the only way to push the “establishment” was to build an effective political force on the left! Bernie left that project behind but the work still remains, and maybe some of those who followed him to this bitter end in Philadelphia will be among those who will continue the “political revolution” that Bernie promised but will not deliver. I’m with Ti-Grace Atkinson who stated in the comments last week that she will be voting for Jill Stein of the Green Party. If that party can achieve 5% of the nationwide vote they will receive federal recognition and federal matching funds that will help to build the infrastructure for a party of the left that can pressure which ever candidate of which ever of the two major parties wins the November elections. This was the project that Nader undertook in 2000 but it was opposed at every turn by both parties but especially by the Democratic Party, which spent millions to keep the Greens off the ballot not only in “battleground states” but wherever it could succeed. This is a unique moment in America’s political culture. Both major parties find themselves in serious decline and even disarray, and the Democrats’ decline has produced a weak candidate whose only advantage proved to be that she controlled the “machinery” of the party which tilted the scales for her at every opportunity. The other party found itself in such serious disarray that an outsider with a larger-than-life personality entered a crowded but weak field and bullied his way to the top. Further decline and even disintegration may in be store for these parties, and maybe we can help it along in these next four months? I believe all of what Pete says is true but it is missing an important piece. That piece is the fantastic organizing inside and outside the Democratic Party that Socialist Alternative (SA) and others are doing. I think SA was correct to go where people had been activated (even if it was by an election), and I’m struck by how widespread the understanding is of the differences between the people’s needs and what the Dem Party will deliver (After the disputed primaries and Wikileaks revelations of foul play I can no longer call it the Democratic Party). People are feeling burned by Sanders’ capitulation to the Dem’s corporate candidate. The walk out from the DNC could blossom. The immediate result would be to throw support to the Green Party, and Jill Stein did do a very good speech welcoming the convention dissenters in Philadelphia. But there is potential for much more; this year we have the best chance in a lifetime to break open the corporate duopoly and really win a seat at the table for grassroots parties. Disaffected Sandernistas should join the Green Party, struggle in it, and make it the electoral party of the 99%. The Greens are weaker without Bernie but they could grow into a force to be reckoned with if people vote strategically in November. Jill Stein isn’t talking about strategic voting and that is a shame because the vast majority of disaffected Dems are concerned that a vote for the Greens means a vote for Trump. But that is only true, because of our “winner take all” electoral college, if you live in one of about seven states considered competitive between Clinton and Trump, the “battleground” states. Estimates vary, but the most likely swing states are Ohio, Colorado, Iowa, Nevada, New Hampshire, Virginia, and Florida. If you live, as most of us do, in either a solidly “red” or solidly “blue” state, then there is no damage done by voting Green and a whole lot of advantage for the future of the 99%. Jill Stein should be making this point on the election trail. The advantage of voting strategically in this election is that if the Green Party gets 5% of the popular vote nationally they will qualify for millions of dollars in federal funds to support future progressive candidates at all levels of government. And every percentage of the popular vote over the 5% threshold means a million more dollars. This money comes from tax payer dollars, the only fair way to finance elections because it does not give a leg up to the corporations that control the parties of the 1%. Right now the Greens have a few decent candidates for seats in Congress and they are by law required to run a Presidential candidate each cycle. But if disaffected Dems moved into that party, with the boost from federal election funds we could see many more progressives, with high consciousness of the dangers emanating from monied interests, in Congress within a few years. And once the corporate duopoly is broken open, there will be better potential for other parties of the 99% to grow as well. Lest I be misunderstood, I want to make clear that I don’t believe a more progressive Congress will bring about black liberation or women’s liberation, nor will it get legislation passed to eliminate our dependence on fossil fuels, overturn U.S. imperialism and its associated endless wars, or really dismantle mass incarceration. It won’t do this because the right wing is strong and there is always compromise. But it has the potential to begin to get these things accomplished and change the national conversation. It will create breathing space and enable our independent organizing. The Left must stay independent of government so we can demand what we really want, without compromise. But our voices can become amplified when there are open ears in government. I’m starting to understand that when Kshama Sawant of SA says we need a new party of the 99%, she’s not talking primarily about an electoral party, she’s talking about a movement. Yes, we need a bigger more unified movement of the Left to fight for changes that will benefit the vast majority of us. Keeping those disaffected Sandernistas involved in Left organizing is hugely important towards this goal. So much hope. So much fear. Fear of a Donald Trump presidency won out over the hope for Bernie Sanders’ “political revolution” at least for this election–unless…who knows? There may still be a surprise or two before November. Although the “political revolution” that Sanders tenaciously campaigned for (at the age of 74, no less) was hardly socialist, I figured it would never be allowed to happen within the Democratic Party. Still, I felt gut punched when he capitulated. Hillary Clinton and her Democratic supporters gushingly thanking him was transparently hypocritical and only added to the humiliation of both Sander’s and his supporters. Has the Democratic Party really been “moved left” as so many claim? We shall have to see. Words are cheap. On the positive side, it was a delight to see the persistent Bernie supporters, many of them young, taking creative action and daring to be called “ridiculous” by comedian Sarah Silverman at the DNC (and worse by others) for refusing to sit down and shut up in the “house” of some of the world’s most powerful people. Meanwhile, others carried on the protest outside the Convention. It’s a very different situation of course, but it reminds me of the Mississippi Freedom Democratic Party challenge in 1964. Since Black people were shut out of the voting process, the MFDP held elections across the State, carefully following the Democratic Party’s delegate election rules, which the regular all-white Mississippi delegation had not done. The MFDP came to the Democratic National Convention demanding to be seated in their place as the loyal Democrats. They were betrayed by the national Party, headed by liberals Lyndon Johnson and Hubert Humphrey, who offered a “compromise” of seating two MFDP delegates-at-large with no voting rights, which were reserved for the white delegation. Four of the MFDP delegation voted to accept the compromise, but the vast majority refused it and went back to continue their work in Mississippi. It’s a riveting story with some of the same elements. The Johnson/Humphrey Democratic team played a number of dirty tricks on the MFDP, including scheduling an unrelated emergency press conference at the same time that Fannie Lou Hamer was scheduled to address the Credentials Committee on national TV on behalf of the MFDP. Fortunately this attempt to keep her speech from being broadcast across the nation failed, as the TV networks chose to broadcast Hamer’s speech in its entirety later in the day. I still remember sitting in front of the TV mesmerized by this 6th-grade-educated sharecropper eloquently “telling it like it is“. The push to support the lesser evil/less dangerous candidate has been active since that 1964 election, the first I was eligible to vote in. There was tremendous pressure to vote for Lyndon Johnson to stop Goldwater (who Hillary Clinton worked for) for fear he would blow up the world with a nuclear bomb, but friends in the Mississippi Civil Rights Movement convinced me that Johnson would escalate the war in Vietnam, also a serious threat. Shortly after the election, he was bombing the hell out of Cambodia. Lesson learned. How many more of these goddam elections are we going to have to write off as lame but ‘regrettably necessary’ holding actions? And how many more of these stinking double-downer sideshows will we have to go through before we can get ourselves straight enough to put together some kind of national election that will give me [and] at least the 20 million people I tend to agree with a chance to vote for something, instead of always being faced with that old familiar choice between the lesser of two evils? I understand, along with a lot of other people, that the big thing, this year, is Beating Nixon. But that was also the big thing, as I recall, twelve years ago in 1960—and as far as I can tell, we’ve gone from bad to worse to rotten since then, and the outlook is for more of the same. Unless those of us totally outside of the two main parties are able to chart a new course, we are in for yet another “holding action” that holds little. The fear-mongering and the chastising of those who refuse to vote for the Democrats began against those who supported Sanders and is only going to heat up. 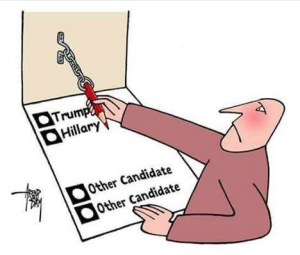 Anyone not voting for Clinton is being charged with voting for Trump. I am scared of Trump. I am scared of Clinton. (Along with a quarter of U.S. voters who also say they are scared of both.) So how did we get here? I’d say 52 years of “lesser evil” voting had a lot to do with it and I’m sick of the short-sighted refrain every four years that its too dangerous to do anything else but dig ourselves deeper into the hole. We may already be at the point of no return, and Hillary Clinton is certainly no solution. I’m not even convinced she is the “lesser evil”, given her record. The Democratic Party puts up a hugely unlikeable candidate who has a horrific history as a warmonger, who laughs at the gory death of one of her “regime change” victims, a creator of a one refugee crisis after another, a recipient of Wall Street largess, a racist incarceration supporter, and an attacker of the poor (especially women and children by supporting the end of “welfare as we know it”) — and those of us who go for something better are the culprits responsible for electing Trump? Incredible! If Trump is elected, it will be the fault of the Democratic Party, their supporters, and those who think “breaking the glass ceiling” should be the number one concern of women. (Only the 1% come even close enough to the glass ceiling to touch it.) The Democrats made their choice and it was a really, really bad one. They had a better chance of winning with Sanders, but they would rather Trump win this election than lose — or even share — control of the Party. As a feminist activist for most of my adult life, I would like to vote for a woman who could win the presidency, but that woman cannot be Hillary Clinton, whose record I abhor. So I will probably vote for Jill Stein, not just as a protest vote, but as a vote for a possible better future — or maybe any future at all. Not because I believe Stein can win this election, but because if enough people vote for her and begin to act in coalition, it could put her into the national election debates, helping break the grip of the two capitalist parties and moving us toward a working people’s party that could win in future elections. As “election fever” takes over until November, we must remember that we will need to fight with other means just as forcefully as with the ballot box. Electoral politics can never succeed without an organized movement of working people who are the backbone of any country and who potentially hold the real power if we can learn to use it successfully. ← Bernie Could Still Win the Presidency!